This year’s Global Climate Action Summit is taking stock and charting the next steps for global climate action by bringing together governments, students, citizens, entrepreneurs and change makers together in San Francisco. The summit will be held from September 12-14, 2018. The event – which includes a main plenary and hundreds of affiliated side performances, workshops, tours and talks – is intended to highlight ongoing action in mitigation and adapting to climate change, and to connect global actors on the next course of action. A series of ‘challenges’ are being proposed to encourage healthy energy systems, healthy cities, inclusive growth, land and ocean stewardship and financial investments in climate action. These challenges will help declare ongoing commitment and a new wave of ambition in creating a prosperous and sustainable future. As a part of the Global Climate Action Summit, Sustainability Solutions Group is holding a one-day symposium on modelling energy and emissions in cities. The event will focus on pathways for low carbon cities, highlighting what has been done and what is possible in modelling low carbon pathways. What exactly have cities achieved? What was included in their respective energy and emissions models? What have been effective areas of action for emissions reductions? What policies have been implemented in cities? What were the outcomes and the lessons learned? How have modellers tackled uncertainties in modelling city emissions pathways? What innovative tools have helped cities understand the best policies to effectively reduce emissions at low cost? What are the next steps of energy modellers, and how will this transform sustainable cities? We know that sharing these insights, barriers and steps forward can help build a better network of support in visioning our cities in a sustainable future. Hearing directly from city officials on their experience can help shape the outcomes for other municipalities in their path towards decarbonization. Listening to modellers and analysts can help build better tools to enable cities in their decision making. We hope you can join us for this discussion by presenting or attending the symposium. Follow these links to submit a proposal to present or register to attend as a participant. The Symposium will be held September 13 from 9 am to 4:30pm at the Women’s Building (3543 18th St, #8, Mission District, San Francisco). If you cannot attend, stay tuned to our newsletter, as we will be keeping updates and summaries as the Global Climate Action Summit approaches. The City of Oslo has embedded emissions reductions deeply into the mechanics of municipal operations. The Vice-Mayor of Oslo discussed her City’s carbon budget, which parallels the City’s financial budget. 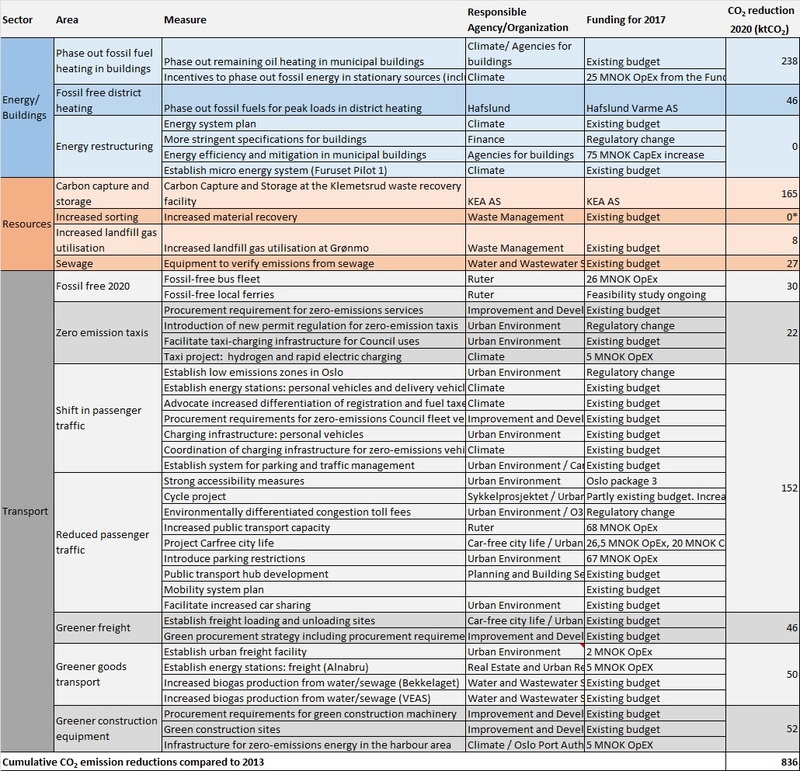 Departments are assigned responsibilities and are required to implement those responsibilities in order to achieve their targets of cutting emissions in half over 1990 levels by 2020 and becoming completely carbon neutral by 2030. This mechanism relies on the strongest tool the city has – the city budget process – and brings a new transparency to greenhouse-gas (GHG) emissions planning, with an annual reporting process. The variety of challenges that cities face, globally, is important to note. On the one hand, there is the sophistication of the approach of Oslo and other northern cities while others are grappling with the challenge of informal settlements. Frequently, there is low or no data available in many of the communities in the Global South. Critically, as one researcher from South Africa pointed out, Africa does not have a carbon problem, they have an energy problem. GHG emissions from Africa barely register relative to those of other Northern countries; in this case, it is more about survival and the imperative is development. Doubling tree cover from 20 to 40% can reduce mean radiant temperature by 4 degrees. A green roof can result in up to 20-degree surface temperature reduction with little impact away from the roof. An Individual tree can result in up to 1.5-degree temperature cooling under it. Inner city parks result in 1 degree of cooling and up to 10 degrees cooling in shade. A large urban lake can result in 1-degree cooling and up to 1 degree of cooling downwind. Finally, on a completely different note, in Holland, the Buurkracht Community Power project has developed a new strategy to unlock community scale retrofits. Led by the Enexis Group, a grid operator owned by local municipalities, the process hinges on the involvement of local volunteers who are community heroes. Step 1: Find local heroes and form community team of the local heroes. The heroes than recruit neighbours. Step 2: Site survey neighbourhood and dwellings. The best five actions to undertake in homes and the neighbourhood are identified, including retrofits, district energy, and solar PV. Step 3: Mobilising the neighbourhood—The measures are presented at a community meeting and contractors are at those meetings. Step 4: Implement the measures. Step 5: Let the savings begin. This is also the first step again for a new round of actions as those who did not participate in the original round begin to notice the retrofit activities and a new round begins. A key insight: it is critical to get women to the meetings, not just men. Another key insight: Many people assumed that environment was not an important motivator, but it actually was. Enexis is now supporting more than 200 neighbourhoods in this process. The day started with the sun beaming in through a wall of glass looking out over Edmonton’s North Saskatchewan River. The discourse on cities was hopeful- tinged with periods of critical thought and realism. Presenters, including the Mayor of Edmonton, Don Iveson, talked about the need to track consumption-based GHG emissions; but the mechanisms that cities require to influence consumption of their citizens are both politically and legally limited. Many speakers talked about green jobs and low-carbon cities as engines of economic growth and development, while others reflected that economic development itself is the source of GHG emissions. Irrespective of the pathway forward, there is no question that the role of local governments and cities is gaining prominence and an increasing focus of UN agencies and other entities in the world; if cities can’t dramatically bend the curve, then there is no way that the world will achieve the necessary reductions of 1.5 degrees. Mayor Iveson emphasised this point with a story about UNFCCC COP 13 in indonesia; as a deputy mayor his option was to represent a non-profit organisation at a side event of a side event. Luckily, times have changed: urban areas are now a primary focus with an IPCC focussed conference on cities. The Intergovernmental Panel on Climate Change (IPCC) will release a much anticipated report on what it will take for the world to stay within 1.5 degrees later this year; this report include a chapter on the role of cities. This 1.5 degree report is expected to the basis of extensive discussion at the next COP later this year, in Poland. In 2024, the IPCC will also prepare a special report specifically on cities. One of the most remarkable speeches was from Aromar Revi of the Indian Institute for Human Settlements (IIHS) and a lead author of the urban areas chapter of the upcoming IPCC report. He highlighted coal plants as stranded assets but said that the most signficant stranded assets are our cities, noting that economic activity, people’s homes, cultural centres in many great cities are at risk from sea level rise. Under the 2015 Paris Agreement (UNFCCC COP 21/CMP 11), countries identified Intended Nationally Determined Contributions (INDC), which were promised emissions reductions, in the lead up to the conference. Three years after those commitments were agreed upon in Paris, we’re about 1 degree above the 1850-1900 mean, which is two thirds of the way to the 1.5C level and halfway to the 2 degree level. The current INDCs are the fast elevator to 2 degrees; the question now are: could we experience an overshoot, how big will that overshoot be and how long will it last? If we had started GHG emissions reductions seriously in Rio de Janeiro (in 2012), we may have had the gift of choice but now societies need to accelerate the transformation of our energy systems, land-use, cities and regions, governance and financing. Ultimately though, Aromar points out, the transition is a question of behavioural and cultural change. And if this transformation occurs, the empire, he indicated, will strike back as this is the nature of the systems. In this case, Aromar drew on the example of Gandhi taking on the greatest empire of the world at the time as a source of hope and inspiration; he concluded that ultimately the objective is to transform not only the system but ourselves. In discussing future climate impacts, a presenter pointed out that the climate of the prairie provinces will resemble that of Texas by 2050; imagine what Texas will look like. The impacts are Increased precipitation early in the growing season and then longer, hotter dryer growing season, creating a need for some form of water storage. The researcher has developed and costed a natural infrastructure system that will provide water storage and protect the City of Winnipeg from flooding. In 2011, the City of Winnipeg experienced a major 1 in a 300 year flood. To protect the City, berms were broken to allow water to spread onto farmland, which both failed to protect the city and caused a nearly $1 billion loss in agricultural activity. A subsequent drought resulted in a further $1 billion in crop losses. No existing civil infrastructure mechanism could both prevent the floods and store water from that “rainy season”. The proposed natural infrastructure system not only solves these problems but also provides a spider web of ancillary benefits. In order to implement this system, a new form of agency will be required to raise the $5 billion required for implementation and generate returns from the different forms of benefits delivered. SSG directors, Yuill Herbert, and Jeremy Murphy, will be in Edmonton at the IPCC Cities and Climate Change Science Conference: Fostering new scientific knowledge for cities based on science, practice and policy, this March 5-7th. Sustainability Solutions Group is proud to be a silver sponsor of this conference. This conference is an important one for the international climate research community. It will bring together representatives from national, local (city) and regional governments, academia, international research organizations, as well as urban planning and climate change practitioners. stimulate research on cities and climate change throughout the Intergovernmental Panel on Climate Change (IPCC) 6th Assessment Report (AR6) cycle. The conference’s outcomes are important because they will inform upcoming IPCC reports as well as support cities and citizens in building low-carbon, climate-resilient and sustainable cities, the implementation of the Paris Agreement on climate change, the New Urban Agenda, and the Sustainable Development Goals (SDGs). If you can’t make it to Edmonton yourself, you can join the live webcast here and get informed by reading the pre-session documents, available here. Follow the Cities IPCC on Twitter. 1000 Cities Launches at Carnegie Hall in NYC! The latest Pathway to Paris concert took place at Carnegie Hall in New York City at the beginning of November. The concert included performances from: Patti Smith, Michael Stipe, Joan Baez, Flea, Talib Kweli, Cat Power, Tanya Tagaq, Tenzin Choegyal, Rebecca Foon, Jesse Paris Smith and featured activists Dr. Vandana Shiva and Bill McKibben. At the concert, the 1000 Cities initiative was launched. The 1000 Cities initiative is a bold mission to meet and go beyond the targets of the Paris Agreement. The initiative invites all cities of the world to transition off of fossil fuels and move to 100% renewable energy by 2040, in order to turn the Paris Agreement into reality. This plan involves citizen engagement, supporting cities with the development of their ambitious climate action plans, and a creative implementation process in collaboration with a diversity of partners to develop one thousand 100% renewable cities by 2040, no longer dependent on fossil fuels. SSG is a proud partner in Pathway to Paris, a collection of artists, activists, academics, musicians, politicians, innovators coming together to fight for climate justice. Co-founded by Jesse Paris Smith and SSG Director Rebecca Foon, Pathway to Paris includes a series of musical events in various cities, radio shows, and cutting-edge news, drawing upon proven examples to demonstrate that significant reductions in GHG emissions are possible and improve quality of life. http://www.ssg.coop/wp-content/uploads/2015/01/ssg_logo.png 0 0 Naomi Devine http://www.ssg.coop/wp-content/uploads/2015/01/ssg_logo.png Naomi Devine2018-01-04 13:33:142018-01-04 13:37:151000 Cities Launches at Carnegie Hall in NYC! Sustainability Solutions Group (SSG) is pleased to announce that our latest report, TransformTO: Climate Action for a Healthy, Equitable, Prosperous Toronto (Results of Modelling Greenhouse Gas Emissions to 2050), was adopted, unanimously, by Toronto City Council today. TransformTO is a community-wide, cross-corporate initiative of the City of Toronto and The Toronto Atmospheric Fund. It was designed to engage residents, other stakeholders, experts, and all City operations in identifying ways to reduce Toronto’s greenhouse gas emissions (GHGs) by 30 percent by 2020, and by 80 percent by 2050, against 1990 levels. SSG and whatIf? Technologies worked with city staff, stakeholders and community members to develop a pathway to achieve 80% emissions reductions by 2050 using currently available technologies. The process involved the development of future scenarios, spatial modelling, analysis of co-benefits and co-harms for the scenarios as well as community input. Opportunities for collaborative and sustained emissions reduction efforts by the City of Toronto, the private sector, higher levels of government, and Toronto residents are included in the report. SSG’s and whatIf? Technologies’ CityInSight energy, emissions and finance model was key to the analysis. CityInSight incorporates the Global Protocol for Community-Scale Greenhouse Gas Emission Inventories (GPC), a standard that enables emissions comparability between cities globally. The model creates and compares land-use scenarios that assess varying considerations for transportation, building types and densities, energy use, energy production systems, liquid and solid waste production and treatments, infrastructure, and all associated costs and paybacks, in order to assess what emissions reduction actions are possible and what should be prioritized. Two scenarios were defined for the project: Business as Planned (BAP) and Low Carbon Scenario (LCS). The BAP scenario explored projected energy and emissions levels for the city under current and planned policies and actions by municipal, provincial and federal governments. The LCS explored additional actions options that, if taken, will achieve Toronto’s emissions reduction targets. Council’s adoption of the TransformTO report signals the ambition of Canada’s largest city in taking the lead on climate change mitigation through critical emissions reduction actions – actions that will also improve the quality of life of Toronto’s residents. Sustainability Solutions Group (SSG) is a climate change and sustainable communities consultancy with offices across Canada. We’re a cooperative of critical, creative thinkers who collaborate with cities, communities, and institutions to address some of society’s most pressing challenges: climate change, energy and emissions planning, sustainable development, public health, and democratic engagement. Over the past fifteen years we have worked with over 40 municipalities in Canada to help them build and plan for low-carbon, economically vibrant, and sustainable communities. whatIf? Technologies was founded in 1989 by Robert Hoffman and Bert McInnis – to build upon their pioneering work in socio-economic modelling and simulation at Statistics Canada – and by software architect Michael Hoffman (current CEO). Over the last 25 years the firm has established itself as a leader in developing computer-based simulation models for strategic planning and scenario analysis. whatIf has successfully delivered modelling projects in urban and regional planning, energy systems, transportation, and long-term physical economic systems. Join SSG at Renewable Cities. We’re throwing an afterparty you won’t want to miss! 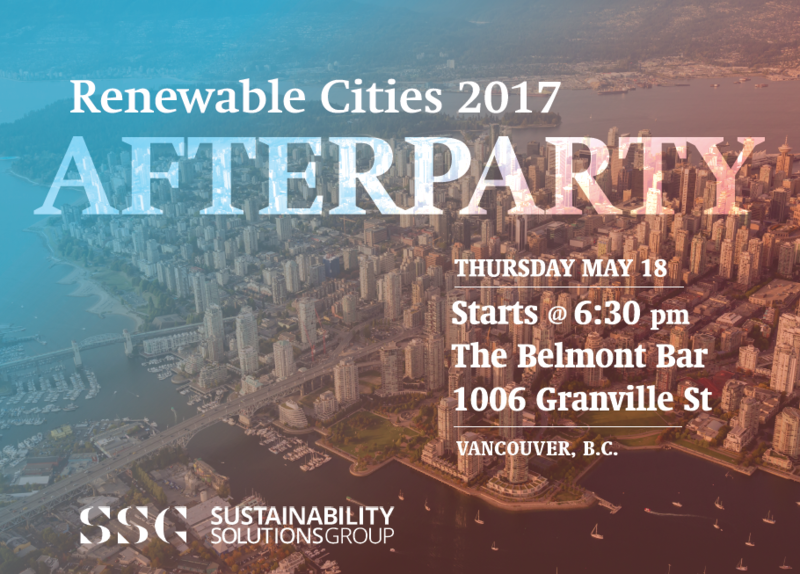 SSG is pleased to support Renewable Cities, a global program of Simon Fraser University’s Centre for Dialogue in Vancouver, Canada. We are participating in their Global Learning Forum 2017: a solutions-focused dialogue on the transition to 100% renewable energy in cities. Leaders from local governments, the private sector, utilities, and the NGO and research communities will be in attendance and we look forward to connecting with everyone. In celebration of our recent report, TransformTO: Climate Action for a Healthy, Equitable & Prosperous Toronto – The Pathway to a Low Carbon Future, we are throwing an afterparty for all attendees of Renewable Cities. Join us for a social evening to connect, engage, and share your stories about how we are working to make cities renewable, one step at a time. SSG members Jeremy Murphy, Julia Meyer-MacLeod, and Naomi Devine will be attending Renewable Cities. Be sure to connect with us and say hello at the event or at our afterparty. http://www.ssg.coop/wp-content/uploads/2015/01/Screen-Shot-2017-05-15-at-13.42.27.png 907 1903 Naomi Devine http://www.ssg.coop/wp-content/uploads/2015/01/ssg_logo.png Naomi Devine2017-05-15 17:05:482017-05-15 21:46:27Join SSG at Renewable Cities. We're throwing an afterparty you won't want to miss! 2016 saw many urban-related climate action developments. This January, we’re taking a look at the good, the not so good, and what may be in store for 2017. At the end of 2015, nations at the 21st meeting of the Conference of Parties (COP 21) adopted The Paris Agreement, the outcome of the UN Framework Convention on Climate Change (UNFCCC). To come into legal force, the agreement had to be ratified (signed into legal force by each country’s government) by at least 55 countries representing at least 55% of global emissions. The agreement has now been signed by 194 countries and ratified by 118, covering 80% of global emissions. One of the key objectives of the Agreement is to limit global warming well below 2°C above pre-industrial temperatures and pursue efforts to limit the temperature increase to 1.5°C, which would avoid the worst of projected climate change impacts. For cities, ratification of the The Paris Agreement means there should be increased national climate change initiatives, as well as support for municipal corporate and community emissions reductions and renewable energy projects. Interested in tracking the Paris Agreement? The New York Times: The Paris Agreement on Climate Change is Official. Now What? Toronto has adopted the ambitious and exciting goal of reducing emissions 80% below 1990 levels (or 17,600,000 tonnes per year) by 2050. The TransformTO project was undertaken to achieve this goal. It is a collaborative project co-led by the City of Toronto’s Environment and Energy Division and the Toronto Atmospheric Fund. TransformTO is informed by community engagements and robust technical scenario modelling, aiming to understand what the most emissions, energy and cost-effective carbon reduction strategies are for the city. The results will generate a long-term climate strategy that updates Toronto’s existing Climate Action Plan. SSG is leading the high profile energy and emissions quantification project for TransformTO. The modelling aspects of the project include developing an action plan for reaching the City’s 2020 GHG reduction target, and a decision-support framework focused on achieving Toronto’s reduction target, which aligns with the Province’s reduction of 80% below 1990 levels by 2050. Phase 1 involved developing a GHG emissions baseline and Build-As-Planned (BAP) scenario to quantify the emissions reductions potentials of Scope 1 and Scope 2 emissions to the year 2050. The inventory and projection is undertaken according to the Global Protocol for Cities (GPC) using CityInSight, a spatially explicit energy, emissions and finance model developed by SSG and whatIf? Technologies. This process involved significant efforts in collecting, organizing, and interpreting data from public and private entities, including spatial geographical information (GIS) and Municipal Property Assessment Corporation (MPAC) data. A major analysis of City, Regional and Provincial policy was undertaken to develop assumptions and model a BAP scenario. Phase 2, currently underway, involves modelling the GHG emissions reduction potential of implementing a host of low carbon actions to meet the City’s target, and an analysis of the co-benefits and co-harms of these actions. A key focus has been evaluating the implications of land-use policy for key GHG emissions drivers such as transportation and buildings, and the opportunities associated with interventions such as transit and district energy. The Prime Minister and First Ministers of eight provinces (Manitoba and Saskatchewan declined to participate) and three territories agreed to a national framework for climate change and clean growth in 2016. A national price on carbon will be implemented as a key part of the framework. It will be $10 per tonne of emissions starting in 2018, rising to $50 per tonne by 2022. The federal government will impose a carbon tax on those provinces that do not enact their own. Deliver annual progress reports on implementation. The International Institute for Sustainable Development analyzes the plan from an international leadership perspective. What might be in store for 2017? The C40 Cities Ecocity Summit will take place July 12-14, 2017 in Melbourne, Australia. Track global action with the UNFCCC’s Global Climate Action tracker. The Climate Leadership Conference will take place in Chicago in early March. The People’s Climate March will take place on Saturday April 29th, in Washington, DC. The Green Climate Fund has approved US$315 million for new projects and programmes. Boston will host the third US-China Climate Leaders Summit. The Sustainable Development Goals, adopted in Rio de Janiero (UN Conference on Sustainable Development) in 2012, continue on, and number 13 is about climate action. You can track global progress toward this goal here, on IISD’s SDG action website. The UNFCCC continues the work of bringing parties (countries) together to work on global climate action with a packed schedule in 2017. COP23 will take place in Bonn, Germany, hosted by Fiji. SSG is leading a high profile energy and emissions quantification project known as TransformTO. The modelling aspects of TransformTO include developing an action plan for reaching the City’s 2020 GHG reduction target, and a decision-support framework focused on achieving Toronto’s 2050 80×50 GHG reduction target, which aligns with the Province’s reduction of 80% below 1990 levels by 2050. Both the short term and long term analysis involved quantifying measures and actions directly relevant to those indicated in Schedule 1. Part 1 involved developing a GHG emissions baseline and Build-As-Planned (BAP) scenario to quantify the emissions reductions potentials of Scope 1 and Scope 2 emissions to the year 2050. The inventory and projection is undertaken according to the Global Protocol for Cities (GPC) using CityInSight, a spatially explicit energy, emissions and finance model developed by SSG and whatIf? Technologies. This process involved significant efforts in collecting, organizing, and interpreting data from public and private entities, including spatial geographical information (GIS) and Municipal Property Assessment Corporation (MPAC) data. A major analysis of City, Regional and Provincial policy was undertaken to develop assumptions and model a BAP scenario. Part 2, currently underway, involves modelling the GHG emissions reduction potential of implementing a host of low carbon actions to meet the City’s target, and an analysis of the co-benefits and co-harms of these actions. A key focus has been evaluating the implications of land-use policy for key GHG emissions drivers such as transportation and buildings, and the opportunities associated with interventions such as transit and district energy. The Baseline & BAP reports are complete. The 2020 plan is complete and has been approved by Council where it was sent to the budget committee. A detailed research & analysis report looking at the of Co-benefits and Co-harms Associated with Low Carbon Actions has been produced. We are currently completing the low carbon modelling for 2050 – modelling the impact of low carbon actions using our model, CityInSight. Kelly Watson is a Research Associate at the University of Manchester. She recently submitted her PhD thesis that investigated how to measure and disseminate the social value of buildings, using methodologies from the social impact sector. Her current post-doc research has developed a wellbeing valuation approach for the built environment, to promote understanding of the impact of design on the people that use it.